New tower to replace ugly one? I've searched high and low, and am looking for a tower (that can fold) to fit my '93 Echelon. Anyone know where I can pick up a folding tower for such an old beast? My question is, some redneck rigged the current ugly tower to the boat. It was drilled and installed correctly. However, if I purchase a new tower I doubt they will be able to use the existing holes. So would a boat shop be able to repair the old holes? Would that compromise the structure and integrity of the boat? Pic below of the functional, yet ugly girl. They also have a full height tower that's 6" taller. Mounting points look close, may need an oversized aluminum plate underneath to cover any existing holes. Take it of and have a shop plug the holes. It will look as good as new. I would buy a Samson tower for it. Google image search has a lot of images for ideas. BTW, except for the tower, I think you boat looks great! Just fill the old holes with epoxy, and cover them with some custom deck track. Your tower is not ugly, it just has a vintage look that resembles something found in a playground. Before you remove, it would be hilarious to see the look completed by adding a swing, and put a small kid on it with the center window open. Then take a picture and repost! Maybe the swing idea is not so fun for mom or kids, and even driver while taking waves, but if nothing else with the right supports maybe it can be reused in your backyard. If you never plan on adding another tower, you could just fill the holes with almost anything and place a sticker on top. But the holes can all be properly fixed with fiberglass and gelcoat so your new tower mounts can be put exactly where they need to be located. Once you find a better tower that you like, it would be easy to make a top piece out of virtually thing (billet, carbon fiber, Gator Grip, Hydroturf, etc). That top piece would be big enough to cover the old holes & accommodate the new tower foot. Thanks! I try and keep it in good shape. I am considering selling it if I don't replace the tower. This looks like the best option based on everything I've seen. Should I purchase this, I will post many, many pictures. This will happen when I remove the tower. Never seen anyone on this board talk about roswell towers, but might be another option for you. They have always looked well built and they make or used to make the towers on some Moombas. Yeah, or maybe some pop up cleats, especially up front? I never understood why manufacturers built their towers to be mounted on the sides of the boat. I can't tell you how many of them I've seen have a problem after the tower foot hit a dock or another boat & the cracks in the fiberglass start spreading. Mount it on top & it solves the problem. You can mount top or sides with this one since the feet adjust in both planes. Page 9 is top mount in instructions. But for universal towers you really need to have the option. The one I installed on my old Bayliner couldn't have been top mounted due to the lack of flat surface up front to mount it to. Have a look at Samson Sports. I really like that Roswell Aviator. Nice and easy to fold, tons of toys to bolt onto it. Looks great. But $3Gs for a universal is a tough market. Oh snap... That's pretty expensive. I was looking through the gallery on the Roswell site. Saw this bimini. Did he put this together right? That is definitely some tinker toy looking setup. I suppose it is now days. When I bought the "cheap" one I put on my Bayliner it was around $2200. Aftermarket towers were still a pretty novel idea at the time. OP has to make the call, but IMO dropping anything north of 1K on a closed bow Echelon is not a wise financial decision. 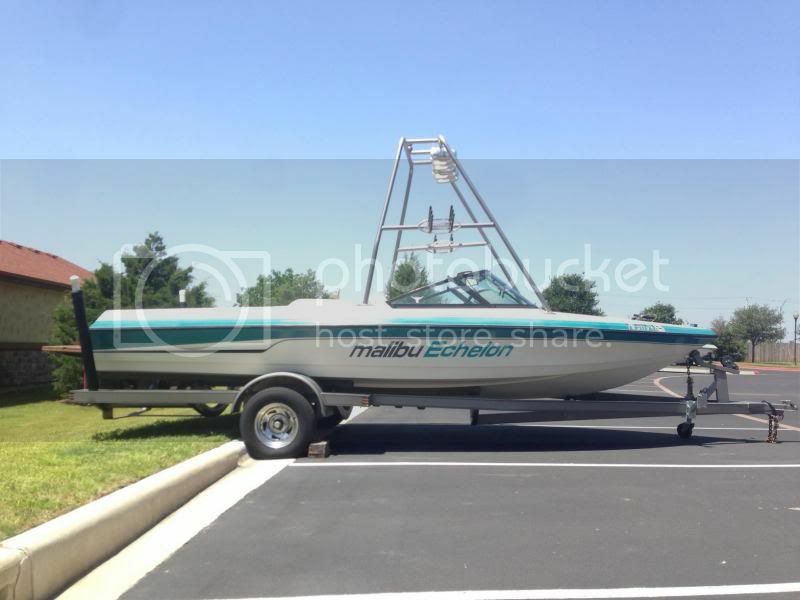 Better to sell and upgrade to a new used boat with a pre-existing tower. OP could pick up a nice response with a titan tower for 10-12K, or a sunsetter in the 14-16k range. I would think of buying a new boat, but I do love my echelon. It's my first boat, and why buy something new when I could just make it better. Down the road I do eventually want to buy a newer malibu, possibly a VTX. Until then, the '93 will just have to do. ............., and why buy something new when I could just make it better. .
You'll have to get some feedback from the guys who have done it. I went from a 94 MC 205 (similar to an Echelon in a lot of ways) to an 05 Vride. Definitely a bigger boat payment. 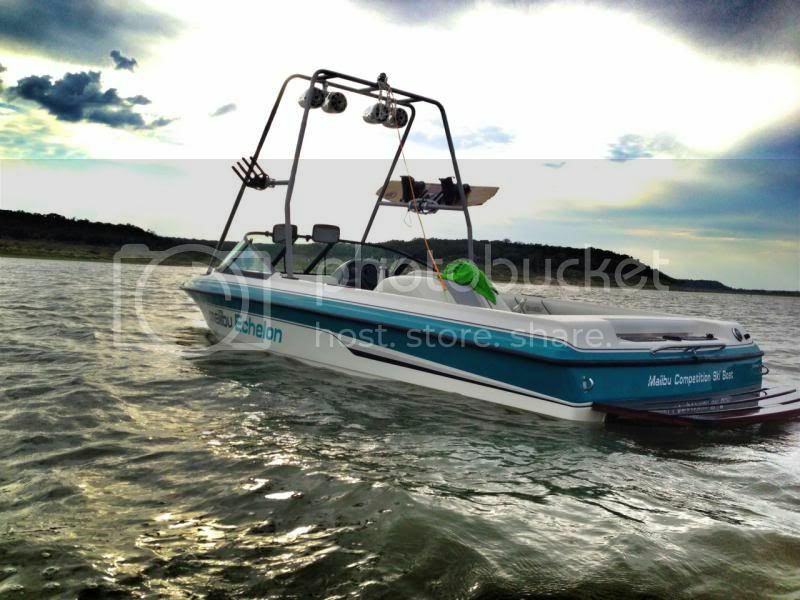 But for me it was a much better wake, more seats, more storage, MUCH better boating experience on the lake, especially with all the surf wakes out there to contend with. I resisted & my wife wanted the v-drive. She won. But I came around eventually.